Case Sheet: Severe head injury with skull fractures and nasal bone fracture.Due to mastoid fracture on left side behind ear there has been bleeding from brain.Lungs capacity has been reduced very low because of thrust injury and there has been infection and contusion in lungs.it takes approximately minimum ten days more to just come out of danger and even recovery takes some more time. 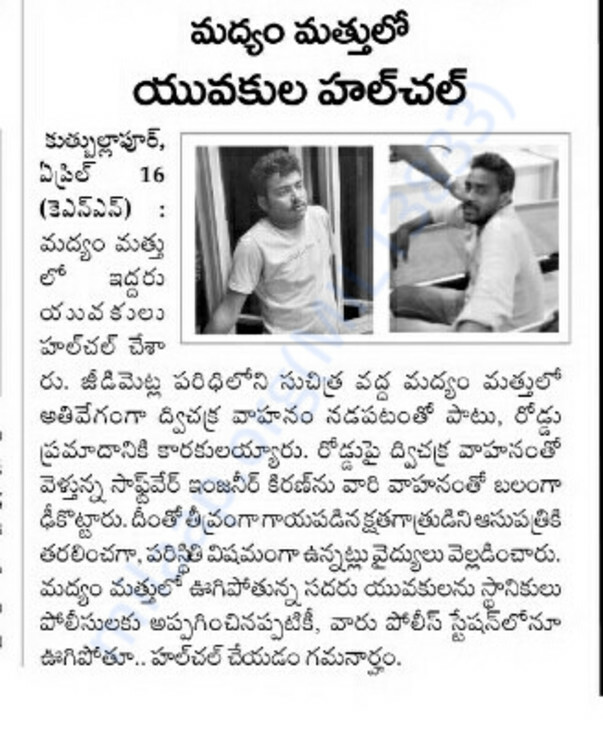 Details of the patient: He is working as a software engineer in UHG. He is the only source and his father expired a year ago. Recently he did his sister marriage and financially low. 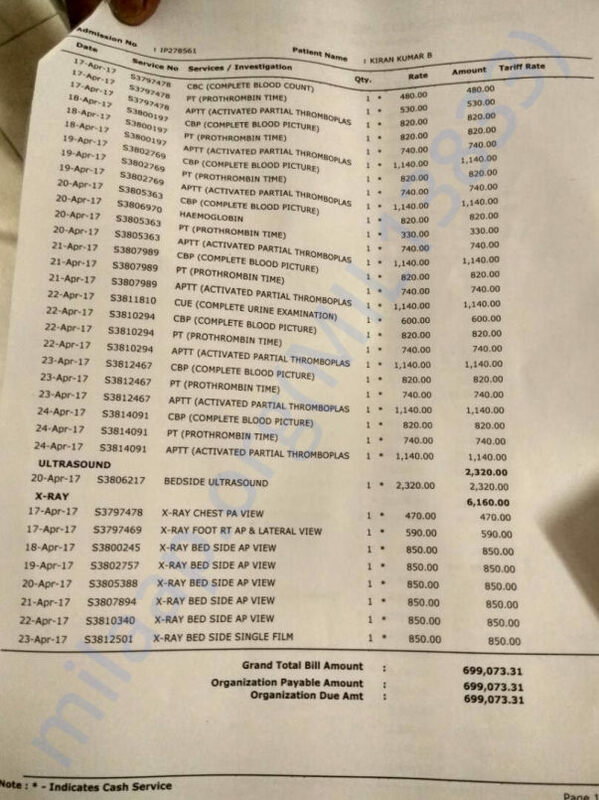 For 4 days, we got bill of 4.5 lakhs and he have only 3.5 Lakhs insurance coverage. Last page of first four days bill. It my pleasure to inform you that Kiran recovered completely and back to office again. With all your blessing and support he is doing good. I wish you every one a happy new year and I wish all your dream come true. Thank you for all your support, which make us to realize that humanity exist in this world. Very happy to hear that kiran is doing good.Still in ICU but getting good positive signs day by day. Insurance also increased and final amount from insurance is 6.3 lakhs. Thanks to UHG team for a wonderful efforts. 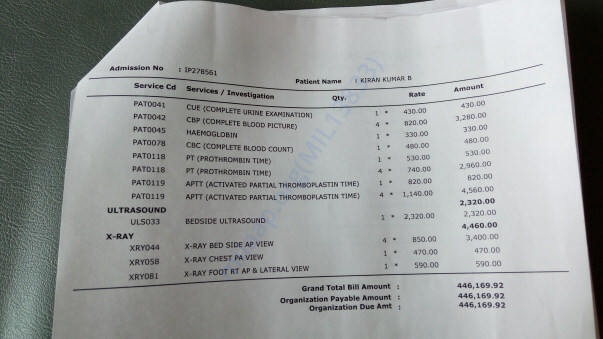 Till now hospital bill is near to 12 lakhs. Slowly bill amount is decreasing . We got good funding through milaap. So we decided to stop campaign on milaap by today. Truthfully, we couldn't do this without you. Thanks for all your support, love and prayers on kiran..
Once again thanks to all of you. We wish success and happiness to you & to your family. Please convey this message to all your friends. 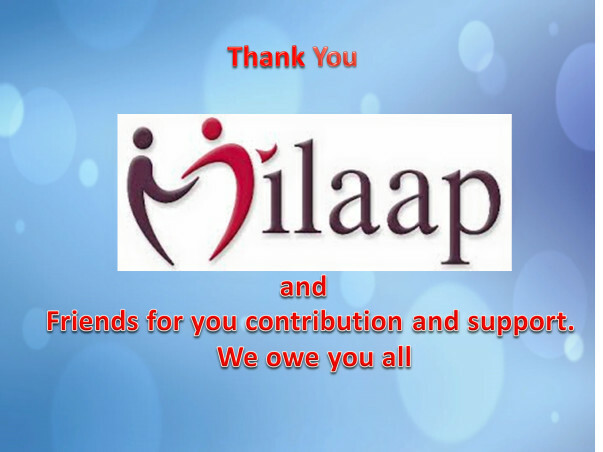 Thanking one and all for your extended support over prayers & financial funding. Status of Patient: He is recovering but little slow. 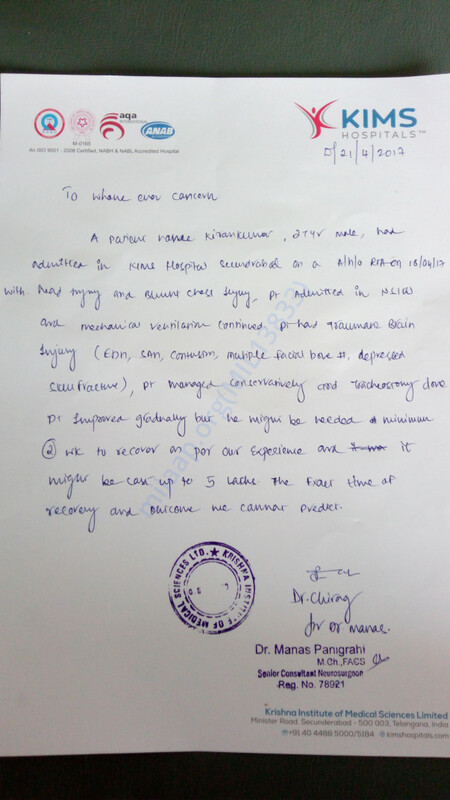 We are appending the last page of first 7 days bill, we got near to 7 lakhs. At the end of treatment we will upload all the bills Please forward this message as much as you can to your contacts. Please don't share, forward and post in twitter and Facebook. We will be update the status of the recovery of patient in next couple of days. Don't treat it as a SPAM, as we increased target to 20 lakhs.